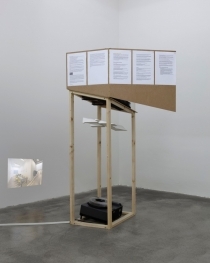 The questions that form the basis of Adrien Tirtiaux’s spatial interventions possess a common denominator: the experience that various forms of people’s movement or behavior inside rooms show a tendency to be transformed into commonality – as if there were an instruction manual explaining how to use them. This point of view allows us to not only forget the optional usage of spaces, but defines them as manifest pre-settings. His interventions provide optional instructions that alter the appearance of the space according to each social and cultural situation, and thus evoke new spaces of action. And if a spatial image appears as something that is impossible, there is perhaps a hidden or forgotten variable lurking just behind it – a space within the space.